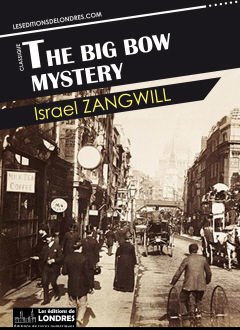 “The Big bow mystery” is a crime novel written in 1892 by Israel Zangwill. “The Big bow mystery” is considered to be the first “locked-room mystery”, written several years before Le mystère de la chambre jaune by Gaston Leroux, and is also one of the best known English crime classics. Despite precedents with The purloined letter or The murders of the rue Morgue by Edgar Allan Poe and The adventure of the speckled band by Conan Doyle, no one had ever before attempted to create a murder mystery where the victim is assassinated in a place which no one could enter or exit. During a foggy day in December, at a house on 11, Glover Street in the Bow, Mr Arthur Constant is found dead by Mrs Drabdump and Mr Grodman. The problem: the door was locked from the inside. Maybe Mr Constant committed suicide? This is what is at first believed. But he has not. So? So, the solution is both extremely simple and extraordinary. “The Big bow mystery” is an extraordinary book, which ranks up there with the best crime novels ever written. It is funny, witty, the description of the characters is typical of a humourist, there is the element of the rivalry between two policemen (or former policeman), Wimp and Grodman, who hate each other but still have lunch together. The motivation for the crime is wonderfully cynical and misanthropic, bordering on the absurd. In many ways, it is a bit as though a gifted writer had taken inspiration from Edgar Allan Poe for the clinical manner in which he describes the investigation, its journalistic account which makes the murder proceedings even more real, leading to the trial of an innocent man, and mixed it with East London Jewish humour for the tongue-in-cheek style, the absurd tone. The structure, with multiple short scenes that are perfectly sewn together, always places some caricatural characters in ridiculous situations with pompous. This is written against the backdrop of social tensions exemplified by riots and short appearances by real life politicians such as Gladtstone, who appears in the novel. There are also references to Schopenhauer, to Poe's The murders in the rue Morgue, and to the Whitechapel murders (Jack the ripper; the novel is written in 1892, 4 years after the tragic events of Whitechapel). The solution, exposed in the last few pages of the novel, the motivation for the crime and the motivation for the murderer to reveal his identity are striking and witty to the extreme. This is a real gem of a crime novel, an absolute must-read.